NEXT EVENT-March-September 2019, one day per fortnight. Intouch Yoga Teacher Trainings are personal and intimate, boutique trainings with numbers less than 12 students. If you place a high value on authenticity, depth of knowledge, and maintaining the ancient tradition and culture of yoga to gain and impart all of its benefits, not just at the level of the body but beyond, this training could be the one you’ve been searching for. Flo Fenton has a vast array of skills and depth of knowledge gained over thousands of hours of training in yoga teaching and yoga therapy with the giants of yoga, and 20 years of teaching experience. Intouch Yoga Teacher Training will teach you how to work with yoga not just as a physical exercise, but as it was intended, as a way of accessing prana, the life force. This approach enables you to fine tune not just your own practice, but to make your teaching accessible, beneficial and unique to each individual student. 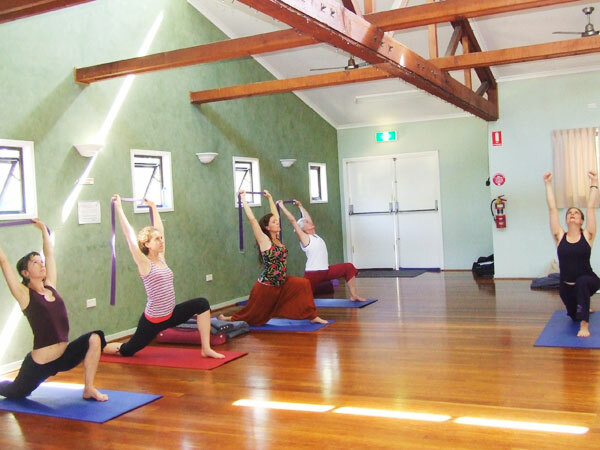 Join me for this in depth Level 2 Yoga Teacher Training in Suffolk Park/Lennox Head NSW. Our format of one day per fortnight, spread over 7-8 months per module with breaks for school holidays, is particularly appealing for those of us juggling work and families.This training is fully accredited and internationally recognized with Yoga Australia. Each module is recognised by Yoga Australia as a 150 Hour Post Graduate Training Course-meaning you can do either one, or both, depending on whether you are currently holding a 200 hour or 350 hour level 1 training. A strong emphasis in injury prevention and management, and a basic understanding of the principles of Yoga for Individual Needs differentiates this training and the skills you will learn. Learn how to teach in a way that makes yoga beneficial and accessible to all people, including those who are stiff and those with injuries or health issues. Learn what is involved in assessing exactly what each student most needs from a practice to best progress. You will learn to teach one on one and in groups in a way that allows space for individual needs and thus enables you to work with a much broader range of clients. The training would suit those wishing to go beyond generic class-style teaching, and into the world of teaching yoga at an individual level whether in a private one on one setting, or during therapeutic classes, courses or retreats. NOTE; This course does not qualify you as a registered yoga therapist-this requires additional study and/or a post graduate diploma in yoga therapy. However you will learn skills that will assist you in all areas of teaching and help you avoid and manage injury in your students in class or one on one teaching settings, and gain a firm foundation in the basic principals of Yoga for Indivdual Needs. First, to develop a balanced and integral practice and lifestyle habits for ourselves. In terms of our personal practice, the intention will be to move into the higher limbs of yoga. This means that unlike many other Level Two trainings, which see progression in practice as learning more and more variations of complicated asana routines, our goal will be to strengthen our foundation in asana, but then to cultivate a greater grounding in pranayama, meditation, and mantra practice. To learn how to provide therapeutic courses and sequences for others. Following on from our Level One training, which has a strong focus on injury prevention , the Level Two training delves deeper into the field of yoga for individual needs; looking at the principles of applying yoga therapeuticly, and learning about some common ailments and how we can use yoga to manage these conditions and encourage healthy change. There is a prerequisite that you have completed a 200 Hour Level One training that is deemed of sufficiently high a standard and with the required background information to enable you to integrate and understand the Intouch Yoga Level Two training. If you are not a graduate of the Intouch Yoga Level One training, you will be asked to purchase the Intouch Yoga Level One 200 Hour Teacher Training Manual and read it thoroughly, and you may also be asked to complete some written or verbal assessments before being accepted onto the course. How do I choose between all of the Teacher Trainings on offer? There are many teacher trainings out there. They broadly fall into two categories; those that are run purely as a business venture, and aim to attract the largest number of students possible for the minimum outlay to the school per student, and those that are offered with a sincere desire to impart knowledge at the highest standard possible. This training represents a distillation of understanding aquired through Flo’s life journey in yoga and healing. It’s aim will be to raise the standard of teacher trainings and to impart a higher level of understanding than is usually taught. What makes this training better than one of the cookie cutter trainings offered by large schools? There is currently only ONE Level Two teacher training offered per year, ensuring freshness and full enthusiasm from all of the teachers involved. You will learn to teach at a much higher level than is offered on most Level Two trainings. You will learn not only how to teach classes, but also how to construct therapeutic courses that cater to individual needs, including therapeutic applications of sequencing asana and pranayama, mantra and mudra for therapeutic purposes. You will Learn to OBSERVE and ASSESS where the student is right now, and what they need to work on at this moment to achieve the best and most beneficial results both in the short term and in the long term. What differentiates this training above all else is its focus on learning how to MODIFY the classical practice of yoga to suit the needs of the individual. In the level two training, this aspect of the whole training is deepened, as we delve into the therapeutic application of yoga for common ailments and conditions. Flo Fenton has long been known for her ability to adapt the practice of yoga using props and modifications of the classical postures, as well as using supplementary yoga practices and pranic work towards a specific outcome. In this way those with physical limitations, injuries or deeper health issues are able to safely and beneficially use yoga as a tool towards optimal health and well-being. This ability to adapt the practice to suit individual needs was at the heart of the teachings of Sri T Krishnamacharya, the teacher of BKS Iyengar, Sri K Pattbhi Jois, and TVK Desikachar. It is the basis of what is now called Yoga Therapy . The aim of this training will be to lay the foundations of understanding both the subject and ourselves, so that we may then offer guidance to others. “When I was looking for a yoga teacher training, I researched all the available courses very carefully. I had practiced and taught martial arts internationally for many years and been practicing yoga for a decade, so I wanted a very high standard of learning to be on offer. I was also aware that there was a big difference between a teacher training with real heart and soul, and the many ?production line? style courses that are offered nowadays! What I was looking for was a rounded and in depth course covering all of the limbs of yoga, and also yoga for special needs and therapy. Ideally, I was looking for a course with under 20 students at one time. There are many courses available close to home in WA, however I knew that this course with Flo at Byron Bay would be a win, because I had already had the privilege of learning from Flo whilst in Byron Bay a couple of times before in the last 5 years. The course more than exceeded my expectations. The quality of teaching was superb. Several very high level instructors shared their expertise in different areas: philosophy, anatomy, physiology, and yoga for special needs. Asana, Pranayama and Meditation built the core of the course and were greatly complimented with regular chanting and Yoga Nidra practice. A relatively small group of 14 students from around the world practiced intensely together all day long for a month, creating a special energy. Great vegetarian dinners were made even more special as they became the place at which we all naturally shared our daily experiences. The location was fantastic, with opportunities to jump into the ocean during breaks- and watch the sunrise!